On the 21st of December 1988, a civilian passenger flight from London, PanAm Flight 103, was crossing Scottish airspace on its way to New York when the plane exploded. 257 passengers and crew members plunged to their deaths. The debris mostly fell on the sleepy Scottish village of Lockerbie, killing 11 residents. The world was in shock, the families of the dead were torn between the trauma and senselessness of loss and the unrelentent desire for answers, for closure. Two alleged members of the Libyan secret services are eventually flagged up as chief suspects. International pressure mounted on the Libyan regime to surrender them and, eventually, they are brought to trial in the Netherlands, by a Scottish court. The trial ends in 2001, one of the suspects is acquitted. To the surprise of many observers, the other , Abd Elbasset Al Megrahi, is found guilty and sentenced to life emprisonment, with a minimum of 27 years to be served behind bars. However, in 2009, Al Megrahi, who had been diagnosed with terminal cancer and given three months to live, appeals to be released on humanitarian grounds so he can spend those last few days of his life with his loved ones. The Scottish government grants the request despite the vociferous protests of many relatives of those killed in the crash. On Aug 20, 2009. Al Megrahi flies home and lands to a hero’s welcome. As of June 2010, ten months after his release, he is reported to be taking part in the making of a documentary attempting to prove his innocence. Michael Eaton’s play, which had its world premiere at the Nottingham Playhouse on Friday and is running until the 19th, is an attempt to reconstruct, to re-imagine, and to reinterpret the events of the past twenty two years, but also to question and to raise doubts. 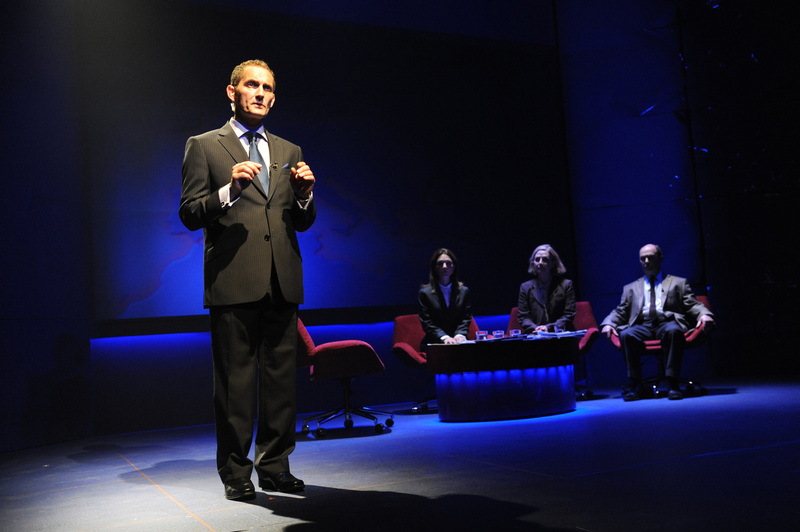 The play centers around the emotional and moral turmoil experienced by three fictional relatives of those killed: Geoffrey (Robert Benfield) and Maureen (Joan Moon), an English couple who lost their talented musican son in the crash, and Laura (Jennifer Woodward), an American widow, whose husband served in the US marines. The play starts with them taking part in a TV show covering Al Megrahi’s release, hosted by a Jeremy Kyle figure (David Beckford) who is clearly hoping for an eruption of bile and anger from his three guests. The three protagonists had initially met at the very start, in the hours after the crash, having all flown to Lockerbie, seeking answers and finding none. Their despair and torment is further prolonged by the evasive and sometimes hostile attitude of the law enforcement officers they encounter. We then see the trio’s journey through the subsequent two decades. In their desperate efforts to understand, to put the pieces together. The attempts to forget are futile. The attempts to move on are suspended while the quest for the truth remains unquenched. They watch as the identity of the likely suspects keep changing from Palestinian to Iranian to Libyan, and as the attempts to bring anyone to justice flounder and meander. When the trial begins, it quickly becomes evident it will be a tortuously protracted affair. Hundreds of witnesses are called. Thousands of documents are to be sifted through. In terms of emotional traction and punch, this play is a triumph. The direction is robust and the writing is sharp without compromising on the attention to detail. This is crucial, because detail is everything: it’s all about who said what, when and to whom. Eaton’s mastery of the historical context is evident and his meticulous faithfulness to the facts is justified without draining the play of its dramatic intensity. Considering the scope and ambition of the narreative, the chronology can seem dauntingly truncated at times but the attentive audience member will be rewarded with a rich tapestry of connections, possibilities and, more often than not, troubling cul-de-sacs. The issues raised by the Lockerbie tragedy (or, indeed, tragedies) are as weighty as they get: who owns victimhood? who speaks for the dead and their wishes? is seeking revenge sometimes the only possible human response? can forgiveness ever be a mere cop-out? The acting is remarkably calibrated, ensuring the four actors cover a dozen parts in total, including US, UK and Libyan politicians and officials. The difference in outlook between the British couple and their American fellow griever, subtle at the very start, grows with time and with each subsequent disappointment and letdown, ultimately ending in a fairly crude demarcation between a loftily skeptical British stoicism and a visceral jingoisom from the American. By the closing stages of the play, the audience is too implicated to opt out of the political, and indeed, moral consequences of their own detective work, trying to follow Eaton’s clues into a possible, comprehensible resolution: Were the right people put on trial? was the right person convicted? was it right to release him? was justice served? A number of actual relatives of Lockerbie victims have already raised that very last question about the wisdom of staging this play in the first place. Though artistic expression is its own justification, one must feel extreme sympathy for those relatives who feel resentful or pained at this new effort at excavation or, as has been alleged, “exploitation”. It’s my opinion that Eaton amply deserves the benefit of the doubt here, but you might reach your own, different conclusions. So: if you get the chance, catch this play before its run ends on Saturday. It’s a play that might not have the answers but certainly seems to raise some of the most pertinent (if painful) questions of our time. And as we know, when it comes to addressing issues of truth and justice, asking the right questions is a very good place to start indeed. 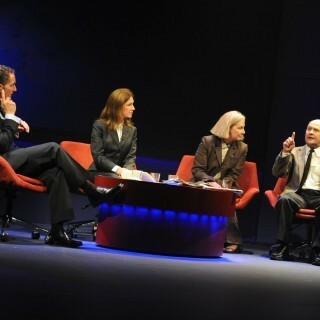 The “Families of Lockerbie” is on at the Nottingham Playhouse until this Satursday June 19th. Call the Box Office on 0115 941 9419 or visit the Playhouse website for bookings.